Commemorates the bicentennial of Margaret Fuller's birth with a dynamic collection of excerpts from her writings. Includes an overview of Fuller's life and legacy and a list of recommended resources. A contemporary of Emerson and Thoreau and a leading public intellectual of her time, Margaret Fuller, a lifelong Unitarian, has yet to be elevated by history to the status of her peers. But her impact on the leading Transcendentalists of the day as a religious radical, political revolutionary, social reformer and forceful advocate of women's rights remains significant, even today. In addition to serving as editor of the Transcendentalist magazine, the Dial, and writing her manifesto Woman in the Nineteenth Century, Fuller was a transnational, cosmopolitan figure whose work and influence transcend the provincialism of New England and nineteenth-century American culture. Certainly I am nowise yet an angel; but neither am I an utterly weak woman, and far less a cold intellect. God is rarely afar off. Exquisite nature is all around. Life affords vicissitudes enough to try the energies of the human will. I can pray, I can act, I can learn, I can constantly immerse myself in the Divine Beauty. But I also need to love my fellow-men, and to meet the responsive glance of my spiritual kindred. "Barry Andrews is pre-eminent in making our Transcendentalist forebears present to us. Here he introduces the wide-ranging genius of Margaret Fuller, and offers a rich selection of pertinent words from her public and private writings." "In eight concise themes, Editor Barry Andrews provides the reader with a cohesive sampling of the best writing Margaret Fuller gave to the world. Our spirits will be enriched as we read and our own humble writing will be given deeper meaning. Her search for meaning and purpose gives light to what we are searching for in our lives." "What a great resource! 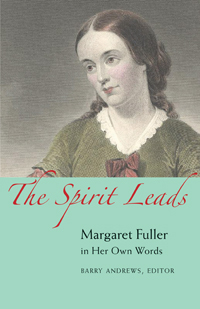 The combination of biographical sketch, commentary on her spiritual and intellectual development, and her own words makes this slim volume an excellent starting place for those who wish to understand why Margaret Fuller matters even today. The timing its publication to coincide with her Bicentennial will encourage engagement with her ideas and empower readers to continue her legacy of inspiring people to think independently, learn through dialogue, believe in the equality of all people, and be open to change."